The last part of the Nineteenth Century experienced a logical extension of the trend in composition that had been going on since the mid-Eighteenth Century: The harmonies and developmental structures became yet more increasingly complex and unpredictable, and it was on purpose. In the so-called ‘Impressionists’ (they didn’t like that term themselves) we enter a mystical, sometimes misty, world of coloring and mood unlike much that came before, and it was now becoming so chromatic that the listener can feel like he’s being pulled away from the fabric of earthly reality. During this era of about 1880 to 1940, together with such Late Romantic composers as Mahler, Schoenberg, and Scriabin, the Impressionists Debussy, Ravel, and Satie set the stage for the truly dissonant music of the Twentieth Century. Yet let’s not just write it off as unmusical or unbeautiful, for there is a marvelous amount of accessible aesthetic value here, and much of the repertoire is still greatly enjoyed by audiences today! 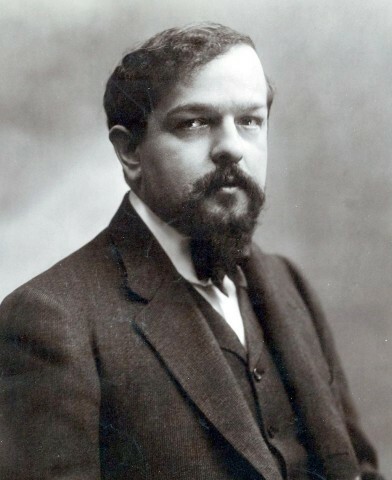 Claude Debussy of France, a friend of the painter Claude Monet, did indeed paint orchestral and pianistic pictures of clouds, ocean surges, springtime festivals, mythical woodland creatures, moonlight, etc. He developed a remarkable technique in some of his works called the whole-tone scale: no half-tone pitches are allowed, so there is a strange openness to the movement of melodies. Debussy’s ‘Clair de Lune’ is one of the most beloved of all piano pieces, and its orchestral version is just as popular; the ‘Prelude to the Afternoon of a Faun’ and ‘Syrinx’ depict ancient mythological scenes; and La Mer is a symphonic poem based on ideas drawn from visual art about the sea. alluring themes. The one-person ballet Bolero starts from almost nothing to build steadily and rhythmically to an explosive ending; the longer ballet Daphnis and Chloe acts out the ancient tale of love. Erik Satie, also French, is best known for ‘Gymnopedie (Barefoot) no. 1’, which has been played by all sorts of genres of instrumentalists in recent decades.